Supermassive black holes many millions of times more massive than the sun reside in the central regions of galaxies. They grow even larger by attracting and consuming nearby gas and dust. If they consume material rapidly, the infalling matter shines brightly and the source is known as a quasar. Some of this infalling matter is not digested, but instead is ejected in the form of so-called jets that punch through the surrounding galaxy and into intergalactic space for millions of light years. These jets, shining brightly at radio wavelengths, are composed of particles accelerated up to nearly the speed of light, but exactly how these particles achieve energies not attainable on the Earth is yet to be completely solved. The discovery on quasar 4C+19.44 gives new insights to the balance between the energy in the field surrounding the quasar and that residing in the quasar jet. This finding indicates the phenomenon arises from an intrinsic property of the source rather than absorption effects. It implies that the energy budget available to accelerate particles and the balance between energy stored in particles and in the magnetic field is less than expected. "This is an important discovery that will be used for years to come to improve simulations of jets. 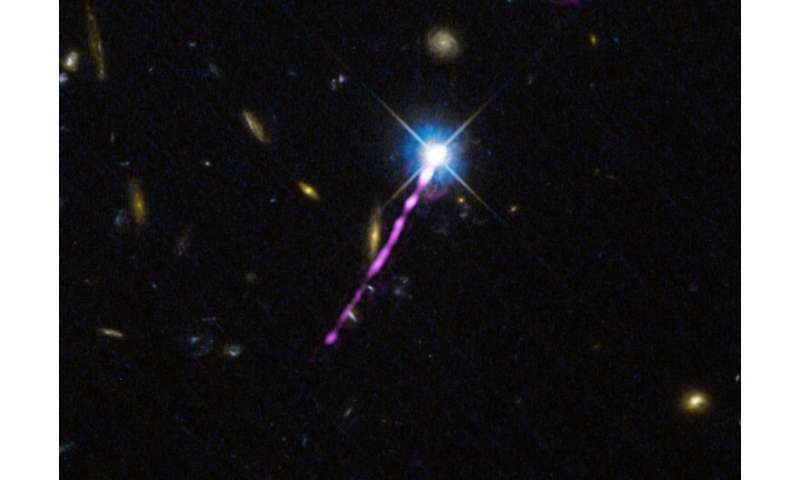 We observed for the first time a new signature of particle acceleration in the power emitted by quasar jets at long radio wavelengths—an unexpected behaviour that changes our interpretation of their evolution," said Prof. Francesco Massaro from University of Turin. "This was already discovered in other cosmic sources, but it was never before observed in quasars." The international team of astrophysicists observed the jet of the quasar 4C+19.44 at short radio wavelengths, in visible light, and X-ray wavelengths. The addition of the LOFAR images allowed astrophysicists to make this discovery. LOFAR is the first radio facility operating at long radio wavelengths, which produces sharp images with a resolution similar to that of the Hubble Space Telescope. "We have been able to perform this experiment thanks to the highest resolution ever achieved at these long radio wavelengths, made possible by LOFAR." Said Dr. Adam Deller, an astrophysicist of the Swinburne University of Technology who contributed to the LOFAR data analysis and imaging of 4C +19.44 while at ASTRON in the Netherlands, heart of the LOFAR collaboration. Dr. Raymond Oonk, an astronomer at ASTRON and Leiden University and Dr. Javier Moldon, astronomer at the University of Manchester, explained that "We have developed new calibration techniques for LOFAR and this has allowed us to separate compact radio structures in the quasar jet known as radio knots, and measure their emitted light. This result was unexpected, and demands deeper investigations. New insights and clues on particle acceleration will come soon, thanks to the international stations of LOFAR." The observation performed on the radio jet of 4C+19.44 was designed by Dr. D. E. Harris, supervisor of Prof. Francesco Massaro, while working at the Harvard-Smithsonian Center for Astrophysics several years ago. He performed the observation in collaboration with Dr. Raffaella Morganti and his friends and colleagues at ASTRON. He only got the opportunity to see preliminary results, as he passed away on 6 December 2015. This publication, published in the first March issue of the Astrophysical Journal, is in memory of his career, which spanned much of the history of radio astronomy. I wonder if the expected energy budget of authors is based on the same mistaken GRT principles as 1998 SN1a supernova data resulting in the DE epicycle as explained by Suntola DU energy principle. At the small values of T4 (cosmic time from BB or DU bounce) and expansion radius R4, the energy levels of emitted EM were orders of larger than implied by the GRT based reduced wavelength of received signal today. See the Planck dilution problem of cosmic distance and angle concepts in DU literature and my past PO posts. Outflows are ubiquitous in astrophysics. Despite different sizes, velocity and amount of transported energy, luminosity and degree of collimation, they have obvious morphological similarities. However, what is important for us, there is the picture of the outflows from everywhere and none of inflows into somewhere. That is an obvious asymmetry. There is no universal mechanism that can explain the origin of all these jets and outflows. There is no consensus about the exact ejection mechanism. The situation is even more severe, for in many cases researchers do not understand what constitutes content of the jets. Is it atomic, molecular or ionic gas, relativistic electrons or protons, or even electron-positron plasma? In this paper we have an opportunity to build a unified model of jets and outflows in the frame of our model [1, 2]. The more we look, the more we find out. This was excellent work. We are getting closer to understanding everything about quasars. According to DU energy principle, every mass object has its energy history and entire universe near DU bounce at T4=R4=0 has hyper-symmetry in the balanced motion/gravitational energy components. The apparent asymmetry of outflows may be found by inflows before T4=0.